Tiger’s Nest is the popular name of the Paro Taktsang Monastery. It’s a prominent Himalayan Buddhist sacred site and temple complex, located in the cliff-side of the upper Paro Valley in Bhutan. The initial temple complex was built in 1692. The monastery is located 10 kilometers (6.2 mi) to the north of Paro and hangs on a precipitous cliff at 10,240 feet above sea-level, about 3,000 feet above the Paro Valley. The monastery buildings consist of four main temples and residential buildings. They are ideally designed by adapting to the rock (granite) ledges, the caves and the rocky terrain. 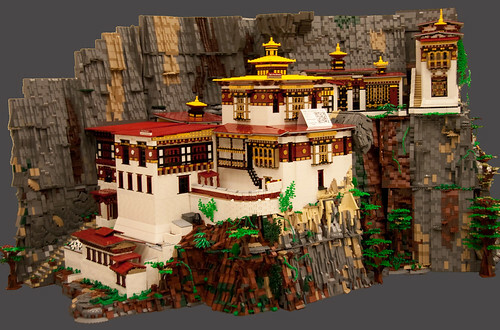 This Lego Model of the Monastery has taken around eight months to build with approximately 200,000 parts.